The Heico Companies. A new general counsel at The Heico Companies discovered there were “literally hundreds of law firms” billing the manufacturer. The GC and a paralegal endeavored to take control. They generated data on which firms were billing Heico the most, then analyzed law firm activity, sorting it into “value-added” and “non-value-added” categories. Heico then calculated every law firm’s “Legal Cycle Efficiency,” and shared the rankings with them. It partnered with one firm determined to improve its efficiency; in the following seven months, time to resolve cases dropped from 600 days to approximately 100 days, and savings from non-value-added work were projected at 10 percent. CSA Group. The legal department at the CSA Group had been “completely uncontrolled” when a new general counsel took over. In her first meeting with the president, he shared three goals: align the legal department with corporate strategy, manage costs and lead people effectively. The general counsel and her team went through the corporate business plan “line by line,” identifying the relevant legal work and grouping tasks by theme and skill level required. They classified tasks based on risk and value. This exercise clearly identified the lower-value, lower-risk work that the department could outsource. It negotiated a flat fee arrangement for routine commercial and employment work that brought a 30 to 50 percent reduction in fees. It brought in a vendor for investigations that reduced the cost of code of conduct inquiries by 90 percent. This freed up the legal team to focus on high-value work in compliance, acquisitions and risk management. These stories prove that legal operations isn’t just a buzzword; once harvested and understood, the data behind your department has tremendous power to help you further your company’s strategy, work more efficiently, manage your team and save time and resources. And it doesn’t have to be tedious. Xakia’s matter management platform takes about 30 seconds per record. With a few keystrokes, you gain invaluable intelligence about workload, resources and strategic value – and automated dashboards and reports to help you tell your own data story. Would you like to learn what Corporate Legal Operations can do for your department? 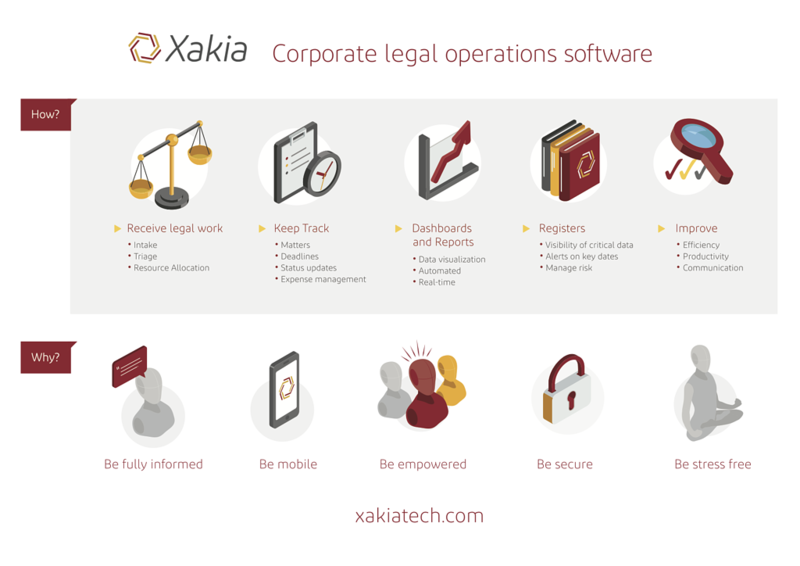 Download our white paper for ten key benefits and see how four simple steps can improve legal operations for teams of any size.